Well my last two weeks winter work have been cancelled I was meant to be working on back to back Winter ML Assessments for Pete Hill and Glenmore Lodge, however due to the lack of snow these have been cancelled. 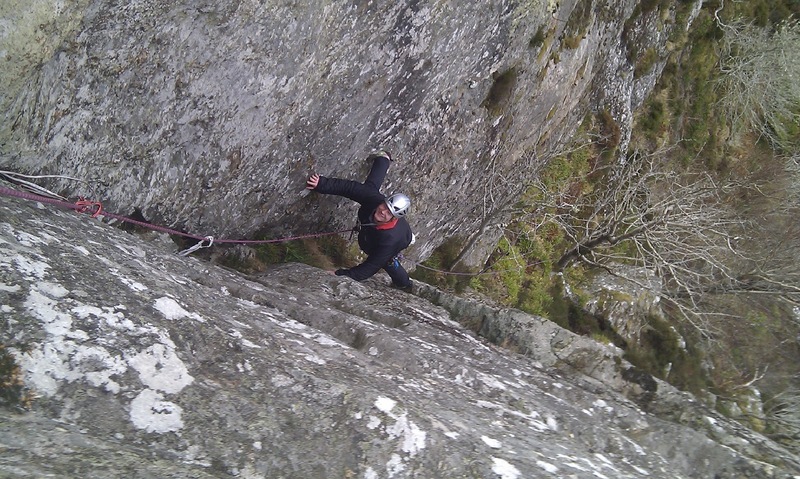 This has allowed me to get out for a few days early season rock climbing, days at Rieff, Logie Head and Duntelchaig have all been a nice way to warm the season up. However the real bonus is that as Laura starts her holidays tomorrow we can go away skiing earlier than planned! We head off at the end of this week for a few days in France, then Switzerland and finally off to the Silvretta in Austria to do the traverse. Back at the end of April ready to get stuck into summer! 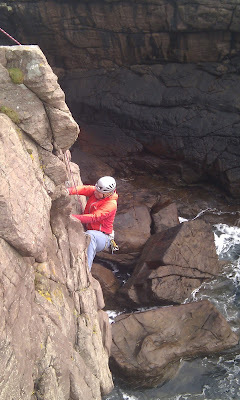 The first few months seems me working Summer ML's, Scrambling in Skye and some Mountain Rock Climbing........fingers crossed for a long dry and midge free Summer!!!!!! I have been working for West Highland College for the last few days along with Bill and Francis. On Wednesday I was at the Ice Factor preparing students for the CWA and then on Thursday and Friday I was out with 3rd Year Students on a snow holing trip. With a poor forecast for the west on Friday we headed to the Cairngorms with a not great forecast but not as wet as the west! We headed into Ciste Mhearad via windy ridge that as indeed windy, were we found a fair bit of new snow that had covered up the remnants of the old holes! 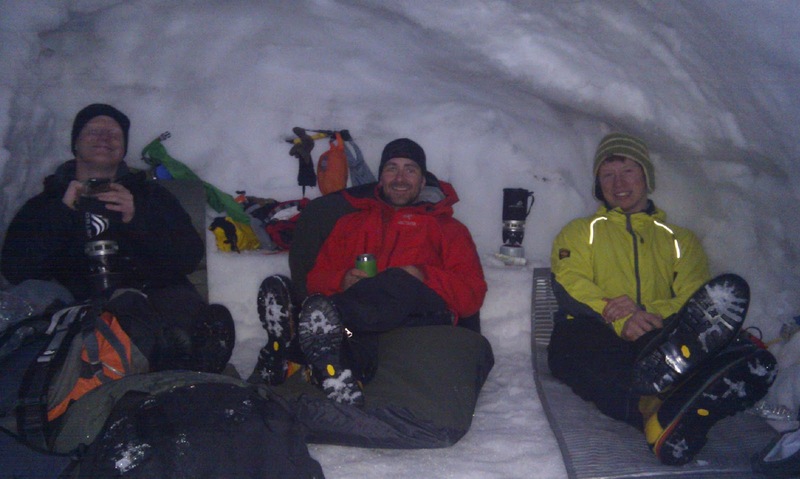 However with a good bit go digging most teams managed to get into the old neve layers under the new snow. We were planning to head out for some night nav but with 100mph winds we decided to just enjoy the holes!! It warmed quickly during the night and much of the new snow melted/sagged/caved in and with more strong winds in the morning gusting 111mph at 8am on Cairngorm it was time to bail! A good experience for the students who did well in some challenging conditions. Everything was melting fast as we walked out through the ski area, it does now feel like winter is on its last legs. 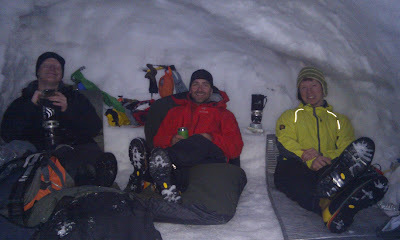 I was out in the Cairngorms over the weekend with King Edwards school from Sheffield. On Saturday we headed into Lochain and the snow patches on the western flank to look at movement skills and then braved the winds and headed up onto the plateau which was actually no that bad. We then dropped into Coire Domhain were we found some good snow to do some ice axe arrests and a look at avalanche assessment before heading back to the car park via the goat track. Sunday was and early start as the team had to head back to Sheffield. We headed up windy ridge to Ciste Mhearad were we had a look in the leftovers of some snow holes and used the steeper ground to look at some movement techniques on steeper terrain. We then headed up on to Cairngorm were we got some good views before heading back to the bus via the Cas. A good weekend out with some super keen students. I now have a few days off before heading west to work for West Highland College first in the Ice Factor and then out snow holing. Lets hope winter continues. After my Ski Mountaineering week was cancelled I thought I was going to have time to put my feet up but I soon found myself working on a Winter ML Assessment for Pete Hill. Whilst there is no climbing to be had in the Cairngorms at present you can still definitely get out to look at winter skills and there is more than enough snow to train and assess Winter ML's. Monday and Tuesday had the team in the Northern Corries area and then for the exped we headed to Carn Ban Mor, were there was enough snow to snowhole. A good few days with the team doing well.